In just 24 sessions of one hour or less, you’ll learn how to build complete, reliable, and modern applications with Visual Basic 2010. Using this book’s straightforward, step-by-step approach, you’ll master the entire process, from navigating VB 2010 to deploying finished solutions. You’ll learn how to write efficient object-oriented code; build superior user interfaces; work with graphics, text, and databases; and even control external applications. Each lesson builds on what you’ve already learned, giving you a strong, practical foundation for success! Step-by-step instructions carefully walk you through the most common Visual Basic 2010 tasks. James Foxall is President of Tigerpaw Software, Inc., a 25 year old commercial software company with more than 25,000 users. He is a leading authority on interface and behavior standards for Windows and Office environments and is an expert on improving business processes through technology. He contributes to several journals and magazines, speaks internationally, teaches college courses on Visual Basic, and has been featured widely in print and online media for his technology expertise. This book is written for newcomers to the Visual Basic IDE as it is a great first step to becoming a VB guru.The author presents the material in clear and manageable language, and if you remain focused as you work through it, you will definitely grasp the concepts!No joke.Speaking of the concepts, they tend to focus more on the features and tools available during Design Time than on writing actual VB code--so just keep that in mind.In fact, if you're looking for a book that focuses primarily on writing Visual Basic code, this is not that book--and quite frankly, you would be better served starting here if you're truly a beginner. 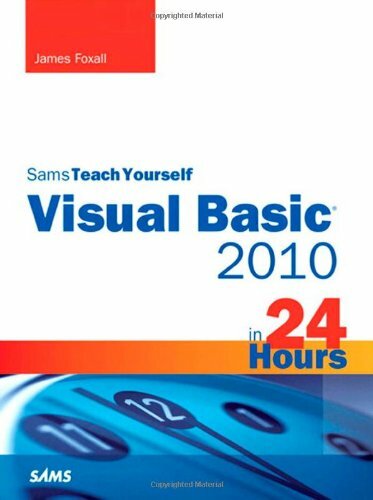 This book is true to it's title because you will learn Visual Basic 2010 in 24 hours (twenty four, hour-long sessions, that is), and it's a great jumping off point to the next step (more advanced code-writing) AFTER you learn what is presented here.I highly recommend this book. I'm reading this book on Kindle for PC. It's really easy to have this open on screen and work in Visual Basic at the same time. I havent tried programming since the mid 90's. Back then it was C+ and I eventually gave up because it took so long to learn and all the lessons seemed so abstract. I am learning so much faster with this book and am excited about programming again. I have already written a useful app (Not Calculator) and I have only owned the book for 2 days. I highly reccommend this book to any begginers like me. Well, I first started with another book (Mastering VB 2010), but it didn't explain everthingwell enough for me to understand. I took C++ 10 years ago in college, but I think it was written for someone with more experience than me. So, I bought this book, and WOW! Much better. Foxall takes the time to explain everything. I am the kind of reader that reads slowly, and makes sure he comprehends every word and sentence. I cannot move on until I'm sure I "get it". So, if you are new to programming, this is the book to buy. I'm planning on finshing this one and the moving on to the other so that I can learn the in-depth stuff a little better. 1) VERY IMPORTANT - Every step is clearly explained. I CAN'T UNDERESTIMATE THIS FOR THE BEGINNER. I had to reread a couple paragraphs to make sure I clearly understood (e.g. Classes/Controls/Methods/Objects and what each word meant in OOP), but that's because it's complicated, not but because he does a poor job. 2) There are not any true "I'll tell you later"'s in the book. If there is a "I'll tell you later", he at least explains the concepts, and just promises to explain "further" in later chapters. This is so important for a beginner to be able to follow what's going on. 4) He inserts just the right balance of pictures and tangential snippets of infomation to keep you busy, having fun, and clear on what your doing - and he doesn't overdo it. The book is not too WORDY or BUSY, but I feel if he left much of anything out it would leave me longing for more answers to my questions. He's either good at seeing from someone else's point of view, or he had an editor without programming experience to help him make sure we readers didn't get lost - I CAN'T UNDERESTIMATE THIS ONE EITHER! This is absolutely ESSENTIAL in a book for beginners. 5) Has all the example/practice code on the publisher's website. This is soooooo necessary for "dummies" or for people who complete the exercises and forget to save! Other books have it to, but I still felt I had to make sure you knew that it was available. You know, I have to be honest. I have no cons to list, but that may be because I don't know enough to complain. But, nonetheless, until I become an experienced programmer, I just don't have any regrets. Kudos to the author and publisher, and I hope to read their C++ book next, so I can compare the two languages for myself. Good luck to all you beginners! This is my first technical book readed in Kindle (Kindle II btw, the white one). About the book, this amazing, very easy to read and instructive. 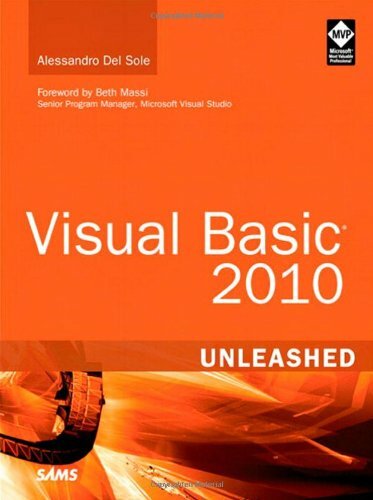 an great introduction to vs and vb in the 2010 edition. But reading tech books with images in an 7" Kindle is not an pleasure, even with zoom. fortunatelly you have the option of reading the kindle books in your win pc and coordinate the reading point. some sample code are shown as image, not text, then these images are hard to read, I think that Kindle needs to improve the image display and an guideliness to authors in order to write code samples as text, not images. Of course all the text based tools in Kindle, as searching and annotate works nicelly for this kind of books. Microsoft Visual Basic (VB) is the most popular programming language in the world, with millions of lines of code used in businesses and applications of all types and sizes. The new release of Visual Basic 2010 is tightly integrated with the Windows operating system and the .NET programming environment. Renowned VB authority Rod Stephens provides a comprehensive guide to Visual Basic programming, including the latest enhancements to the VB language and programming environment with Visual Studio 2010 The tutorial is packed with detailed and practical code examples that show readers how to master all of the features of VB. With this essential resource, you'll be able to quickly review the details of important programming, objects, properties, methods, and events. Are you a Visual Basic 4/5/6 programmer attempting to make the leap to Visual Basic .NET, but find you struggle with information gaps between the two environments?If so, then the book "Visual Basic 2010 Programmer's Reference" by Rod Stephens is for you. Are you an experienced Visual Basic .NET programmer that finds the occasional need to look up information critical to the completion of your project?I say this book is also for you. In my struggle to transition from Visual Basic 5 to the modern Visual Basic .NET, I desperately needed a resource to help me move from a comfortable environment to one that I found left me uncertain about my programming abilities.While searching for a resource, I came across several references to Mr. Stephens' book.After reviewing some sample text online, I decided to purchase the book without further inquiries.Several days and a few hours after the book's arrival, I realized I had made an excellent choice.While other reference books sit in within a few feet of my desk, Mr. Stephen's book has a special place on my desk (when I am not carrying it around and skimming through its pages for more morsels of information). Be aware that "Visual Basic 2010 Programmer's Reference" is supplemented with electronic resources.Many, if not all, code samples within the book are also available for download at Mr. Stephens' invaluable web site, vb-helper.com.You will also find additional resources at the publisher's web site, wrox.com. I highly recommend this book. 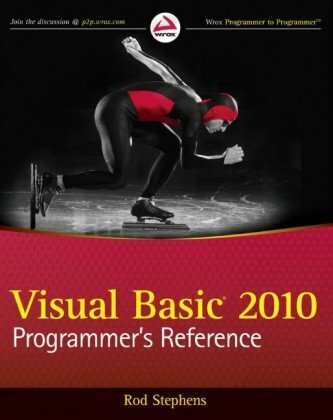 "Visual Basic 2010 Programmer's Reference" will make a fine addition to your library. I only just downloaded this book to the "Kindle for PC" 2 hours ago and I am very disappointed. First, I tried to return it and Amazon will not return these Kindle books.Second the book is mostly a rehash of the help topics that you get from within VS. Consequently you'd probably guess the writing style might be rather repetitive and monotonous. The author must have put himself to sleep writing this many times. But the real issue is usability.The Kindle version has very poor hyperlinking.I would think that strong hyperlinking should be outstanding for an ebook.Not so!In fact there is an icon that says "available for download on [...]".No link there either. Let me say it agin for emphasis.The usability of the Kindle edition is poor.There is no real index.The Kindle for the PC allows me to jump to the table of contents, and there I find an Index that is hyperlinked to an Index section.But guess what?The index entries are not hyperlinked!The publisher needs to be shot and apoligize to its customers, besides returning their money. Likewise the kindle does not know the concept of page numbers.It places a "Locations" tag in the status bar, such at "Locations 2,613-42"Now that's real helpful!!Not. Then for the Kindle PC version, would you expect to be able to select the code examples and copy and paste into Visual Studio?Think again.That ain't happening. I could write more about the actual technical content but why bother? The formatting of thisKindle book is a total disaster.Do not buy it!You can't return it and you'll be totally frustrated with it. This book is an excellent coverage of Visual Basic in the Visual Studio 2010 environment.Over 1000 pages of reference material including appendices.The book is well written, comprehensive, and concise.A reference book needs a good index and this book has one. I purchased the book in April, 2010.It is now three months later and I briefed the reference and am writing my first Visual Bssic program in years.The programming environment has changed dramatically and this book is an entensive guide to my requirements.The text offerscode within the book and links to many sources for assistance.In addition the author offers help through e-mail assistance, which is verytimely.I don't think you can go wrong with this book for the money. I have several of Rod Stephen's books.This one is a great reference book jam packed with examples.I have already used the book to get myself out of several jams.Rod provides in-depth information where it is needed.Rod covers everything including WCF and LINQ. The appendices are also a wealth of information.The book download code works and Rod provides great examples.If you want a great resource book to add to your collection, this is the book for you. I'm in the process of moving old programs from VB 6 and 2005 to 2010.I was looking for something to get me started LINQ in VB as I have yet to use it and this book has been very helpful.By going through the book and the code examples that I downloaded from the web site I was able to figure out what I needed in less than a hour.Of which I think is pretty good considering I have zero exp with LINQ. 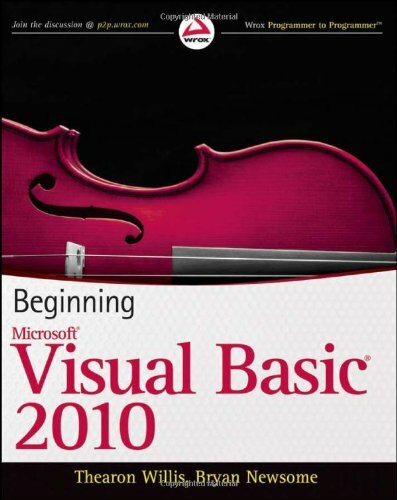 Your hands-on, step-by-step guide to learning Visual Basic® 2010. 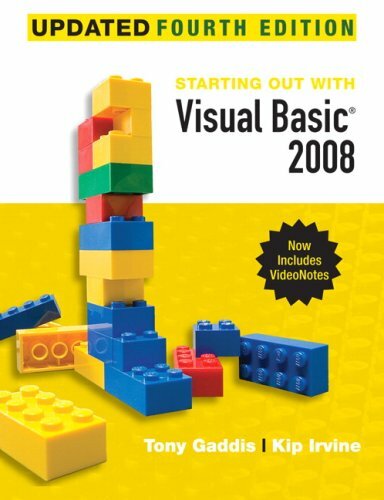 Teach yourself the essential tools and techniques for Visual Basic® 2010-one step at a time. No matter what your skill level, you'll find the practical guidance and examples you need to start building professional applications for Windows® and the Web. Very good for a complete novice! As a complete novice to .NET programming, I found this book to be very good.While it doesn't go into depth into anything, it does provide enough information and experience with features of VB 2010 to make writing simple programs possible.More importantly, it provides the foundation needed to learn from a higher level book on VB 2010 (I used Beginning VB 2010 by Wrox and highly recommend it).The book comes with it's own CD, where datasets and code are provided.Some people will probably not find this book to be as useful as it could be because it doesn't provide the user with enough exercises.It also doesn't provide the reader exposure to a great variety of specific language features.Nevertheless, it is a very useful book for programming novices - just be prepared to purchase a more advanced book on VB 2010 or to learn more some other way. This book is designed to teach you how to write useful programs in Visual Basic 2010 as quickly and easily as possible. You're a beginner to programming and you've chosen Visual Basic 2010 as the place to start. That's a great choice! Visual Basic 2010 is not only easy to learn, it's also fun to use and very powerful. You can program in another language but you're a beginner to .NET programming. Again, you've made a great choice! Whether you've come from Fortran or Visual Basic 6, you'll find that this book quickly gets you up to speed on what you need to know to get the most from Visual Basic 2010. Chapters 1 through 9 provide an introduction to Visual Studio 2010 and Windows programming. These chapters will help you install the Visual Studio 2010 IDE you'll use to create Visual Basic 2010 applications and learn your way around the interface. You'll be introduced to the .NET Framework and the CLR (Common Language Runtime). You'll learn to use variables, data types, comments, methods, and control software flow with the If statement and loops. You'll work with data in arrays, enumerations, constants, structures, ArrayLists, Collections, and tables. Chapter 6 provides an introduction to XAML and Windows Presentation Foundation (WPF) programming. XAML and WPF are the most recent addition to how VB programmers create user interfaces for their applications. You'll also work with events, create toolbars, buttons, forms, display dialog boxes, and create menus. Chapters 11 through 13 provide an introduction to object-oriented programming (OOP) and building objects. You'll use classes, learn about reusability, work with constructors and inheritance, and see .NET Framework classes and namespaces. You’ll learn to work with OOP memory management, class libraries, you'll register assemblies, and see how to use third party class libraries. Chapter 14 provides an introduction to creating Windows Forms user controls. While WPF user interfaces are newer, Windows forms are still in widespread use. You'll create and test controls and work with their properties. Chapters 15 and 16 provide an introduction to programming with databases and covers Access, SQL Server, and ADO.NET. The chapters walk you through the SQL SELECT statement, Access queries, data access components, and data binding. Chapters 17 and 18 provide an introduction to Dynamic Data Web Sites and ASP.NET and show you how to write applications for the Web. You'll work with the most current ASP.NET 4 web techniques in Visual Studio 2010. Chapter 19 provides a brief introduction to XML, a powerful tool for integrating your applications with others—regardless of the language they were written in. Chapter 20 introduces you to deploying applications using ClickOnce technology. This Book is a good starting point for someone new to .NET programming that has had programming before. It seems that all of these 'how to program' books are lacking when it comes to the printer.Aside from sending "Hello World" to the printer the book says 'see microsoft's web site for more detailed examples'. I guess only MicroSoft knows how to make nice looking useful printouts on the printer.My gripe is that the printout is what the end result is.If you can do everything except print you're wasting time. If you need help on pulling data from a data base this book is pretty good. I am an experienced program in main frames with no knowledge in VB. This book was my first on the subject and it is a good guide. After a few weeks, and with the help of MS MSDM, I can create windows and write procedures to handle them. This book is very useful for a beginner, but only for a start, if you want to expand your skills in VB or you have some a previous experience this book is not for you. This is an excellent guide to learning VB 2010.NET for several reasons. 1) It provides many "try it yourself" exercises which give you ample opportunities to use what you read about. 2) It provides "exercises" at the end of each chapter, where you have the opportunity to write simple programs on your own, rather than simply copying code from the book.Answers are provided in an appendix. 3) The book provides the user exposure to a very large number of classes, properties, etc., while, at the same time, clearly explaining what classes, methods, etc. are - as well as their differences.Examples are also provided and are very clear. 4) This book is a step above the 'Step by Step' books, and if you have gone through the 'Step by Step' book, this is a great next book to go through because it provides so much exposure to the methods, classes, modules, etc. which the 'Step by Step' book introduces, but does not give the user much, if any, practical experience. (Personally, I found the 'Step by Step' book to be very useful simply because I am a complete novice .NET programmer - so I am NOT saying the STEP by STEP book is junk!It is most definitely NOT!). 5) If you have some experience with scientific programming languages like IDL or Matlab, but do not have any experience with a .NET language (which is my specific experience), this is a great book to help 'bridge the gap', so to speak, as the two types of programming are very different and it can be very difficult for a Matlab or IDL user to switch to a .NET language (or vice-versa). 6) If you learn by doing, which is probably most of you, buy this book!You will benefit!!! P.S.I never would have thought learning to program could be fun - but it is with this book! I purchased this book as a textbook for a VB class.The instructor preferred VB2008 instead of the listed textbook of VB2010.I decided to see if I could purchase a copy of VB2008 since the bookstore did not have it.The copy I received is brand new with the CD.And the price was about $30.00 less than the VB2010 at the bookstore so, for a change, I was able to buy the proper textbook at Amazon and save $30.00 in the deal. If you're wanting to learn to become a computer programmer using Visual Basics, then this step-by-step book is for you. I'm up to chapter 7 as I write this and I think it is a pretty good book. The author obviously knows the program and Windows in great detail but the material is very accessible. Most of the time what he does is give very detailed instructions on how to prepare example programs; these instructions are clear and accurate. This book doesn't have exercises for readers to construct their own programs, as many books do. Also, sometimes one is just following instructions without really understanding why they work. However, I find that by following the instructions one gradually learns a lot about what Visual Basic can do and how to do it. So I think this is a good book for a beginner. 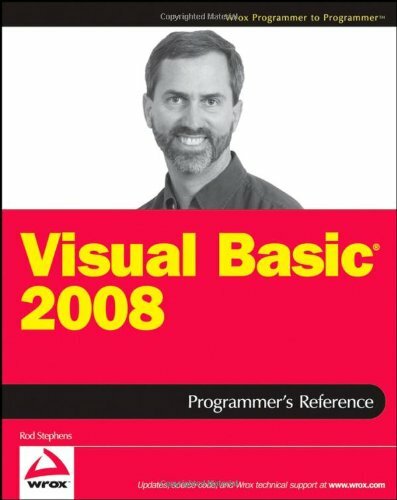 This book is now obsolete, since Visual Basic 2010 has been released and the author's book on that is about to be published. But I expect the new book will be similar to this one. Unless you are just beginning to program, this book will bore you to death. Even if you are a beginner programmer, it will probably still bore you. I suppose you could get some gook information out of it, but it is a struggle to pay attention to it that closely. The author does nothing to keep the reader interested, from my perspective anyway. The programs created start in chapter 1 as a basic program and all the way thru the last chapter in the 700 page book are very basic programs. A little more meat in these programs would have helped. I could'nt read it all. The programs were fun to play with when finished but that too is short lived. Great book! Easy to read, makes things easy to learn. About the shipment: it was faster than I thought. I think this is a great book for all VB developers, both beginners and expert. The author covers all the aspects of VB language, from the basics to the advanced features such as Lamda expressions, extensions, covariance and contra variance and Parallel Programming. Very usefull are the arguments about the Data Access, WPF programming, Azure, Interop (usefull especially for VB6 developers) that helps to start building applications using these technologies. The only "flaw" that I could found is: too many arguments :) (Personally I would have avoided the asp.net chapters, but only because I'm a web developer of course!). Overall it's a great book! This book is an excellent coverage of Visual Basic in the Visual Studio 2010 environment. The book is well written, comprehensive with very good source code samples. It is also an excellent reference for people who have already done some VisualBasic programming. If you want a great resource book to add to your collection, this is the book for you. Strange writing style. A bit annoying. You might want to check this one out in a local book store before purchasing it. I ordered it from Amazon for my Kindle and wish I would have looked at the physical book beforehand. It's the style of writing that bothers me. I'm sure there is good information in the book; however, the way the author (or editor) writes/speaks is annoying. For example, "Pay attention about using Char data types. Char represents a single character and differs from String because the latter one represents a set of characters." The many chapters I've read so far are just like this. Also, the author keeps stating he'll be getting to things later in the chapter. Overall, I find it difficult to follow. Almost like listening to someone who hasn't learned the English language very well. For the beginner or professional: a must have! I had resisted the upgrade from VB6 to the later .Net versions until now.I've relied on prior texts by Murach during my VB6 days and this book is no different.It is a well written text that not only clearly highlights the enhancements of VB 2010, but also smoothes the upgrade path for procrastinators like myself.This book is worth three times the price.Nice job Murach and team. I was channelled to Amazon.com to purchase the textbooks my son urgently needed, which my friend said she had used and received good deals and the goods were delivered in very good condition. I asked my son to look for the books he needed, which he did.I ordered a book to test the service and have been very pleasantly surprised.When I placed the order, I was given a 2-3 week delivery period.Well, Kristofer was very happy when the book came approximately 1 week before the estimated delivery time.Apart from this, during the ordering process, I received updated e-mails from Amazon.com and the supplier, so it was not just a case of them just wanting my money and when the goods arrive they arrive...so take it or leave it.This was never the case...and based on my wonderful experience with Amazon.com, I look forward to purchasing Kristofer's books and anything else I need.Good deals, fantastic service and very professional. BTW, I am in Jamaica and my son is attending college in Florida. The book is set up where there are explanations on one page, followed by a coded visual basic example. This allows the book to not be jumbled.This book gives good coding examples and is everything one should expect from a reference book. I learned programming by reading the dense microsoft manuals (and some of the Borland products) and spent many hours learning C, Basic, Pascal, and the Macro Assembler before the days of the internet (nowhere to go for explanatory help) in the early 80's. This Murach book is a pleasure to read, and makes getting up to speed in VB9 as easy as any programming I've done. Many of the other reviews go into more detail about the book; I agree with most of the positive reviews. 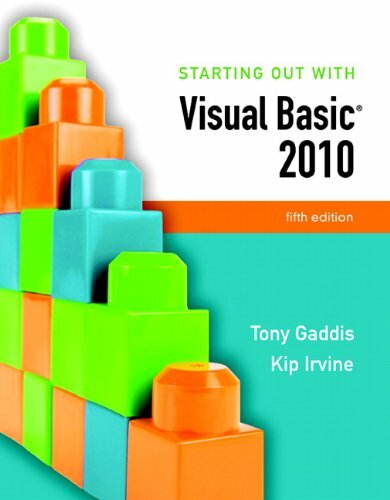 If you want to understand Visual Basic 2008, get this book! This series of textbooks are presented extremely well.Every turn of the page opens a new idea for the reader.A real world scenario is developed from the planning stages to a fully functional application and the reader is invited along for the ride. In just 24 sessions of one hour or less, you will be up and running with Visual Basic 2008. Using a straightforward, step-by-step approach, each lesson builds upon a real-world foundation forged in both technology and business matters, allowing you to learn the essentials of Visual Basic 2008 from the ground up. Step-by-step instructions carefully walk you through the most common questions, issues, and tasks. The Q&A section, quizzes, and exercises help you build and test your knowledge. By the Way notes present interesting pieces of information. Did You Know? tips offer advice or teach an easier way to do something. Watch Out! cautions advise you about potential problems and help you steer clear of disaster. On the Web: Register your book at informit.com/title/9780672329845 for access to author code, examples, updates and corrections as they become available. Having programmed in C, C++, Cobol, and a little Java, I was so surprised by how Visual Basic .net was. While this book focused primarly on application based programs as opposed to web based, it was a HUGE help! In this book, it walks you through writing a program and continually adding to it in subsequent chapters. Sometimes you come across something a little more advanced and it states how it will cover that topic in a later chapter, rathering than giving you a ton of hard to remember info starting out. To make sureyou are learning correctly and for a guide, this book has a corresponding website where you can download the lessons to make sure you understand the code even more if you need to see it as an actual program and not just in a book. All the lessons and examples can be downloaded for free from that site. 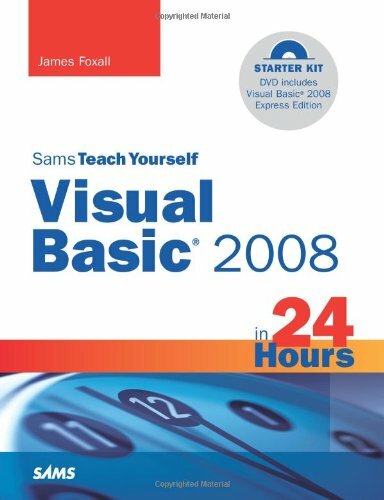 Simply put, if anyone is planning on learning Visual Basic 2008 or higher I suggest this book. Between this book and Google, [...], I have learned a ton! You can follow all the steps in this book and create all the examples without any trouble. But they don't teach you to do anything else except create the examples. They don't teach you visual basic, they teach you how to make pretty forms that do simple tasks. If you want to go beyond the simple examples in this book, you will need a different reference. I needed to write a simple program to read text files and create objects out of them. Very quickly I found I had to put this book down and find the answers I needed on the web. For me, this book was no help. You may find it useful to learn how to make forms. A professional programmer will outgrow this book too quickly. I had appendicitis 2 weeks before Christmas, and had to do all my Christmas shoppingonline.This item was exactly as described and arrived in a timely manner.Thanks! Although I already know several languages, I have learned some things.Basically, I used it to learn the VB.Net rather then VB for Applications.It was easy to follow and set up.However, these chapters take longer then an hour if you don't have photographic memory (take notes or think about things).But, It is still great for learning VB even if you are a beginner. Like the ANY Kindle-only downloaded eBook on an iPHONE, this eBook is USELESS for technical users who need to "mark" in the book or search text. I can't SEARCH in it (for a phrase); I can't save Notes nor Highlights (yes, I can read them on the iPhone-version if I actually had a KINDLE!!! ).All I can do with the iPhone version is READ it and add Page-bookmarks (not "bookmarks w a note").I can't even Copy the Programming-Code-Sections to paste it into my Visual Basic programming environment (unlike a PDF file). If you purchase the ACTUAL PDF version of this book elsewhere, at LEAST you could use Adobe Acrobat PDF reader to search in it (and add bookmarks).SO, either buy the book or buy the PDF version, NOT the Kindle-only version. DO NOT BUY THE EBOOK-KINDLE-VERSION, if you are buying this for the iPhone. Create your own custom Visual Basic programs fast for Windows 95, Windows 98, and Windows NT with the power and friendly object-oriented interface of Microsoft's Visual Basic 6 with Visual Basic 6 For Dummies. 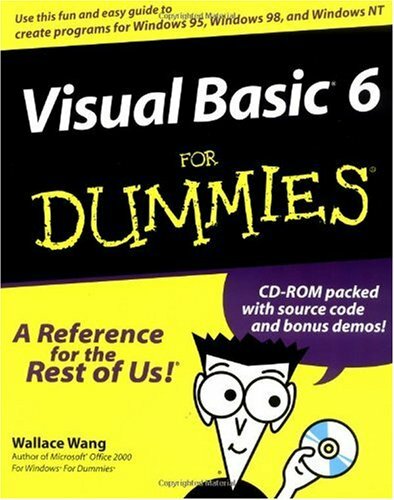 "A witty, well-written guide to Visual Basic 6.0." I have a stack of Visual Basic books to wade through, and I chose this one because, well, I love Wally Wang. We go way back, back to obscure computer magazines and that one night in Vegas when we found $600 (plus an unknown amount of a certain South American currency) in our hotel room. But that's a story for another day. I love the way Wally (known as Wallace on the cover because "Wally Wang" just doesn't translate well in England) writes. He can certainly make a dull subject bright. There is no denying his humor in the figures and throughout the text and examples. The book is massively entertaining. But the question is, does it teach Visual Basic well? And therein lies the rub, not only in this but also with all Visual Basic books. Unlike traditional programming languages, Visual Basic is both a language and a product. So, the question is, which do you talk about first, creating a Visual Basic program or using the Visual Basic interface? Wally opts for the interface first, which he handles well. Alas, my goal in learning any new programming language is to write the first program. In this book, that doesn't happen until chapter 4. Ouch. I generally like Dummies books, but this one is a little weak. The book covers a lot of topics but is really short on examples. I went through 90% of it and still didn't feel like I could actually write a meaningfull program. 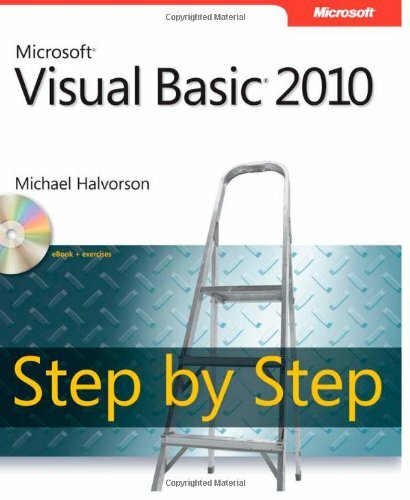 I purchased "Microsoft Visiual Basic 6.0 Professional step by step" by Michael Halvorson and found it to be MUCH better. I'm about 50% of the way through it and have learned a lot more. This book is now obsolete. 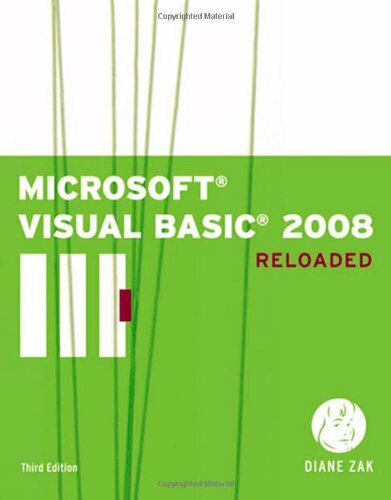 I bought this book and quickly discovered that Visual Book 6 is no longer the latest tool for VB programming.Microsoft has introduced Visual Basic 2005--which you can download free from Microsoft. Consequently, any book on VB6 is really a waste of your time.You would just end up converting your VB6 code to MS VB 2005.Why waste time learning old commands?Go right to the latest. 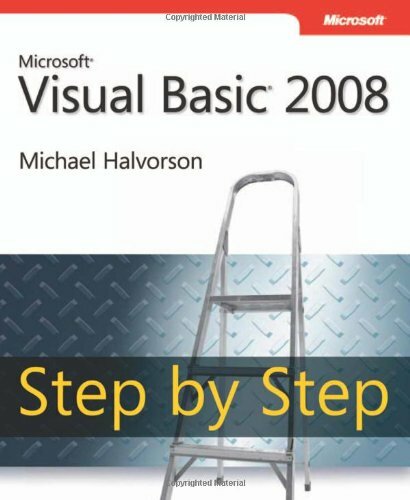 If you want a great book on MS VB 2005 try Michael Halvorson Microsoft Visual Basic 2005 Step by Step. I used this book, and found it very helpful to begin writing vb code.The only drawback is that it is of course covers only the basic stuff with very little background info.If you want to get started in VB, I would suggest this book to anyone. When I was trying to make the upgrade from Visual Basic 4.0 to Visual Basic 6.0, this was the first book that I bought. This book is very easy to read and there are ample examples to illustrate each principle that the author is trying to teach you. I combined this books with the 4 "Learn to Program Visual Basic" books by John Smiley to give me a solid foundation in Visual Basic 6.0.The cartoons in this book will reduce down the stress of trying to learn something new. Sometimes you just need to solve a problem and get on with your work. 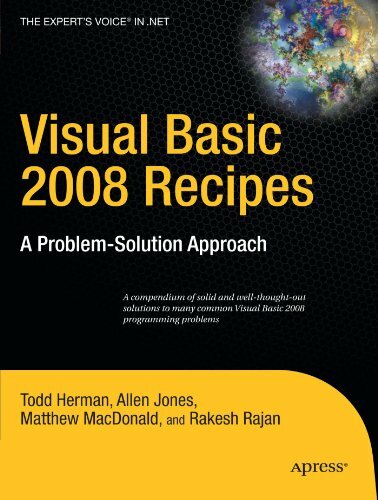 To that end, Visual Basic 2008 Recipes is a compendium of practical solutions for busy VB .NET programmers. Create time for the more interesting aspects of your VB .NET project by solving common problems with the practical solutions and dozens of code examples in this book. Important new .NET 3.5 technologies, such as Windows Presentation Framework (WPF) and Language Integrated Query (LINQ), are covered, and each chapter addresses a specific problem domain, including database access, multimedia, XML manipulation, networking, and security. The code is free to download so you can use the recipes immediately. Take advantage of quality, ready–made solutions to common Visual Basic programming problems. Avoid the tedium of having to reinvent the wheel. Focus instead on the more interesting problems specific to your application. Learn from and be inspired by what the authors have done. Use their work as stepping stones to solve even more complex problems. Cleanly separate user–interface logic from business logic through the use of .NET 3.5’s WPF. Store data to and retrieve data from your relational database using LINQ. Manipulate XML data using LINQ. Make your programs dynamically configurable through the judicious application of reflection. Take advantage of multiple CPU cores by writing multithreaded applications. Integrate multimedia into your Visual Basic projects. Visual Basic 2008 Recipes is written for Visual Basic developers who have at least some experience in developing Visual Basic solutions. The book contains recipes appealing to intermediate through advanced developers. I am going with a neutral review for this book seller. The book was not what I thought it was but that's my fault, not the seller's. They say they shipped it the day after I ordered it but, due to the disruption of air service from the volcano in Iceland, it took a long time to get to me so I can't comment on their speed of service. The 3 people I dealt with (via email) were courteous and helpful so I'll give them full marks for that. I am learning VBA on the job.This resource is good for those of us who learn on the fly.I've shared it with my co-workers as well. Great Product and prompt delivery, So much useful information. This book helped me out alot. Providing programmers and developers of all skill levels with a comprehensive tutorial and reference to Visual Basic (VB) 2008, Microsoft MVP Rod Stephens presents a broad, solid understanding of essential topics on the latest version of VB. He explains the forms, controls, and other objects that VB furnishes for building applications in a modern windows environment. Plus, he examines the powerful development environment that makes VB such a productive language, and he delves into the VB language itself to show you how to use it to perform an array of important development tasks. 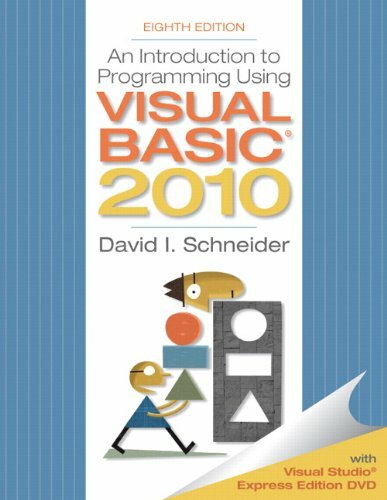 As a professor of computer science I can say that this book is an excellent reference for anyone desiring to program professionally in Visual Basic. This is a great resource of information.Rod has a way of presenting material that hits a home run every time.This book is referenced so much by me that my edition is all dog-eared and ragged. Mr Stephens' writings and approaches to providing the right references to Visual Basic 2008 are second to none. I have purchased three books on the same subject, just to find out that if I have purchased the last book first, I would have same money in the process. His writings and approaches are easy for any first, second, or third grade programmer. His references are clear, with easy to follow examples. The text is well written with code support whuch can be easily downloaded. If, needed Mr Stephen will answer any question and provide "hands-on" assistance to anyone upon request. I will recommend this book to anyone. 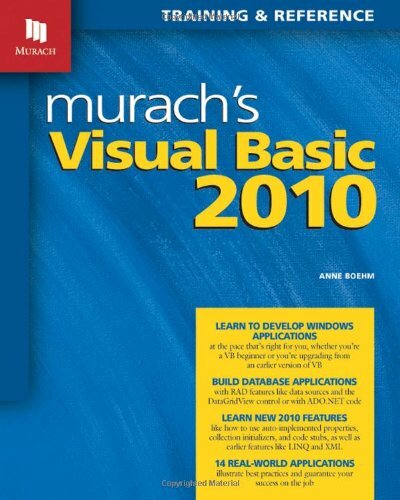 I have bought hundreds of books in the last 25 years and have been programming in VB since Nantucket Clipper in the DOS environment faded (after dBase II), but this just may be the best comprehensive book yet on Visual Basic!I buy from Wrox, Microsoft, Murach and many other fine publishers, but this is truly a great tool to have in your arsenal.I very seldom write reviews, but I felt like I needed to give back any way I could.I don't know Rod Stevens, but my hat is off to him and his team at WROX.Thank You!! !Also, thanks to Microsoft for putting out a great product in Visual Studio 2008! This book makes it easy to learn Visual Basic while using games as a learning tool. My teenage son is interested in programming.Using this book, he has started writing programs immediately. Product was received in brand new condition, like going to a book store. It was packaged well and was shipped like advertised. I was very pleased with the entire transaction and will do business with this individual again, without a doubt. Visual Basic is a favorite programming language, so if you’re new to programming, it’s a great place to start. 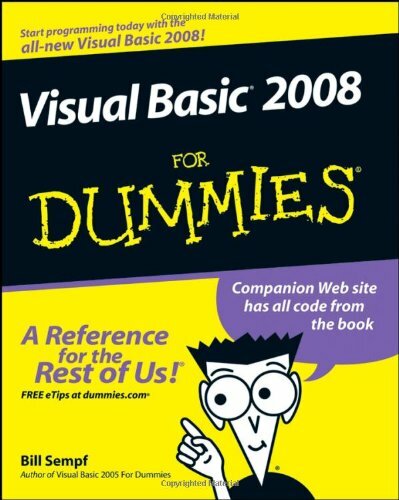 Visual Basic 2008 For Dummies is the fun and easy way to begin creating applications right away while you get the hang of using the Visual Studio environment. Soon you’ll be building all sorts of useful stuff with VB 2008! I reached page 66 and could not endure another sentence.The author endlessly expresses his adoration for VB2008 and explains what he is going to explain further down tin the book so that by page 66 I had learned some things, but certainly not 66 pages worth.I'm getting another book. I needed to take a visual basic course as an elective. Yeah, like a foreign language to a nurse. This book went slow, and really showed in "baby steps" the process, I couldn't have made it through the course without it. I usually do not buy books for Dummies but at a ACM (Association for Computing Machinery) Symposium I heard Bill Sempf speak and after reading his book; I found things in his book that were explained better and with more detail than in the five professional books I bought.I have been programming for 32 years with many different computer languages and now I am working on Visual Studio 2008.I liked the history and the why things are the way they are explained in this book. The book is written in English rather than computerese, which I appreciate. The inclusion of code examples is critical to learning, and this book's got them. Glad I've got this one. While a decent Dummies book in essence, the problem lies in it's target.The main focus on the book is VB 2008 Professional Edition.I find it hard to think of a common situation where a user would have full access to VB'08 PE, a $650 package at least, and be on a "dummies" level.For a user to have a need of this book, they would normally be on an entry level.Most entry level user's would be using VB'08 Express.There are a lot of features he highlights that are not available in this edition.This makes this book of little use for a lot of the "dummies" demographic. I used this book in school. It helped me learn alot by doing all the examples. Has alot of information for beginners but not everything. 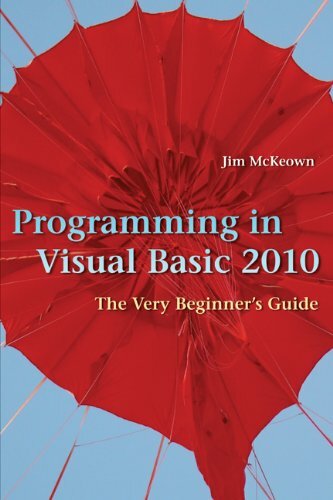 I purchased this book as the text for an introduction to Visual Basic class, and I used it as a reference well into an Advanced VB class that focused on OOP principles. This book is particularly helpful because it introduces concepts and then illustrates those concepts with example code. Luckily, Gaddis decided to show entire solutions and code snippets, which allows readers to understand how these things work in the context of a solution. This is by far one of the most useful programming books I've ever used, and I've used a few. This product arrived in a timely manner and the product was in perfect condition as expected. For undergraduate students in business, MIS, CIS, IT and other computing departments at 2 and 4 year schools learning Visual Basic for the first time. In Starting Out with Visual Basic 2010, Tony Gaddis and Kip Irvine take a step-by-step approach, helping students understand the logic behind developing quality programs while introducing the Visual Basic 2010 language. Fully-updated throughout, the 2010 edition also includes an extensive set of all-new VideoNotes, including walk-throughs of many of the in-chapter tutorials. 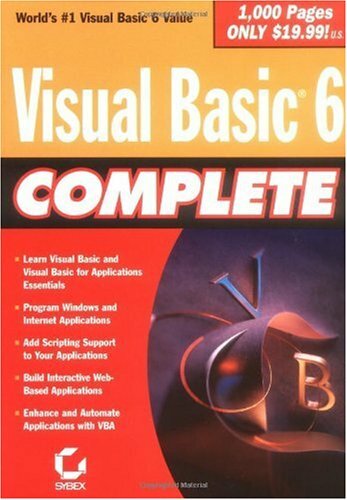 If you want to start learning visual basic then this book is for you! Very enlightening with plenty of examples and descriptions. This book was bundled for my class at Ivy Tech with Programming, Logic and Design comprehensive edition(PLD). PLD was useless and not for a beginning programmer this book allowed me to keep a passing grade in the class!!! First off, I'll disagree with Student2011's review of the book. I'm not too sure why he's knocking it, it is overall a decent book to learn Visual basic 9 with. I was all for the programming exercises at the end of each chapter. They give you a step-by-step approach and apply the concepts of the chapter in the tutorial at the end of the chapter. I'll agree with ML's review when he/she said that Diane Zak throws out some programming terms but these are in bold in the book and if readers don't know what they are - they could do further research. Simple terms get introduced in chapter 1, like 'project, solution, solution explorer window' and a few others. What ML failed to mention though is that toward the end of each chapter before the step-by-step exercises, the author clearly defines these bold 'Key Terms' so the reader could quickly reference their meaning. I felt the book was well put together. Not only consisting of minor key terms and step-by-step programming instructions at the end of each chapter to develop an application, but also Self-Check Questions and Answers (which came in handy for me when quizzing myself or having a friend quiz me), Review Questions, Review Exercises - Short Answer (Where you can give a 1 to multiple paragraph response to questions covered in the chapter) and also 'Computer Exercises' which focuses on you working on programs on your own but has somewhat of a step-by-step approach here as well. The book is great for a beginner Visual Basic .NET programmers approach. The author does a good job in introducing TOE charts (Task, Object, Event). This is basically a chart that a programmer could reference their controls name (under object), give a brief summary of what the control can do (under task), and specify their respective event they'd like to reference for that control (like get focus, validate, click, etc) (this is under event). It event gets you started early with a solid fundamental approach like setting tabindex properties and accept/cancel buttons. I thought this was good because a lot of users like to tab over to text boxes and other controls when dealing with desktop-apps. Chapter 2's creating a user interface was pretty solid in covering these concepts. If I had to complain about anything in the book it'd be chapter 10 - structures and sequential access files. While the author covers how to load files into controls and reading contents of them, Zak clearly misses to address the StreamReader and StreamWriter class - which plays a big roll in .NET when dealing with file i/o. Pulling specific data out of a text file or just writing certain pieces to a text file using the My.Computer.FileSystem. (MethodHere) wasn't covered. This left me reading chapter 10 with a question: 'Seriously - is that all you have on this subject?' Chapter 12 - the 'working with access databases and linq' chapter gives you a decent introduction to databases in .NET but I felt could be larger overall. VB.NET coders are mainly hired anyway to do database applications with SQL Server and Access Databases aren't used too much now days. Zak also introduced the concept of using Try...Catch statements in VB.NET in this chapter which I thought was very late to introduce considering this would of been very useful stuff to know earlier on. She doesn't even go in depth about it either and generalizes the concept by just doing a Catch ex As Exception as oppose to showing how individual exceptions could be caught by doing a Catch As . She may introduce the try/catch block very briefly but she fails to even acknowledge the finally keyword that exists in a try / catch statement and usually comes after the catch block. Usually in other languages, the finally keyword is executed after the catch statement. Programmers use this time to free up memory, etc. I've seen try/catch/finally used in Java and C# when dealing with data, and being introduced to it in a basic paragraph then being fed how it works in an example didn't 'take the cake' for me. Overall - I give the book a 4/5 because of how decently structured it was. Diane Zak missed some concepts and could've put more effort into writing the book, but I suppose that's what Visual Basic Reloaded 4th Edition is for? I am currently using this book for my intro to programming class.I have found that this book is worthless if you have no prior knowledge of programming.It lacks clarity, organization, and step-by-step guides as to how tasks are to be completed.The exercises at the end of the chapters fail to reinforce what was taught in the chapter; they instead add more confusion to the topics.If this book is required for your class, I strongly suggest you purchase an additional step-by-step guide to Visual Basic. This book is easy to read because it guides you step by step to develop a simple program using visual basic. It also has some exercises for you to practice after finishing a chapter. However, you need to have some basic knowledge about programming. It jumps something important about the use of some keywords. 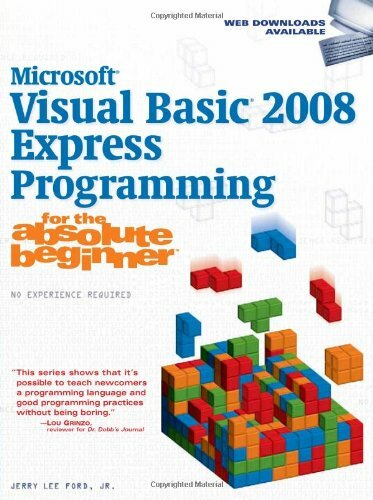 An Introduction to Programming Using Visual Basic 2010, Eighth Edition, — consistently praised by both students and instructors — is designed for students with no prior computer programming experience. Now updated for Visual Basic 2010, Schneider focuses on teaching problem-solving skills and sustainable programming skills. A broad range of real-world examples, section-ending exercises, case studies, and programming projects gives students more hands-on experience than any other Visual Basic book on the market. 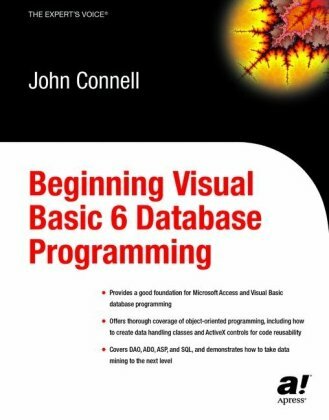 Beginning Visual Basic 6 Database Programming introduces you to databases and takes you all the way through to the latest ADO technologies in Visual Basic 6. Step by step, this book will help you to build working database components and applications in Visual Basic. Whether you want to work with databases on your desktop, get access to legacy data, or program database access across the Internet, this is the book that will get you started. This book provides you with all the practical knowledge and skills you need to build a solid foundation in Microsoft Access and Visual Basic database programming. This comprehensive reference offers thorough coverage of object-oriented programming, including how to create data handling classes and ActiveX controls for code reusability; how to effectively use DAO, ADO, ASP, and SQL; and how to take data mining to the next level. This book covers all of the new and improved data-accessfeatures of Visual Basic 6 (VB6) and illustrates how to put thevarious components and techniques to work in real-worldapplications. The first chapter spells out the concepts of databasesin general and then introduces the reader to the Data Control and theVB Data Form Wizard--a quick way to snap together a databaseinterface. From there, author John Connell spends a few chaptersillustrating how to code the data control and build a "bulletproof"user interface to your data. After a discussion about planning yourdatabase structure, Connell steps you through the process of buildinga fully functional application that uses many important VBfeatures. The chapters include screen shots, diagrams, and codesnippets, with plenty of tips and step-by-step exercises. You candownload the source code for the included examples from thepublisher's Web site. Prior to picking up John's book I had some familiarity with 'desktop' databases like Lotus Approach and MS Access, and had a beginner's understanding of the Basic Language, but felt to intimidated to actually code my own database from scratch in a major programming language. After studying John's material and hand coding the examples (no copy and paste), I gained the confidence necessary to bid on a Database contract in the manufacturing sector. I won the contract. The database has been in production for over 4 years now. The client recently asked me to upgrade it. This IS IMPORTANT, because John's emphasis on good database design, code optimization, and component reuse HELPED me to write code that I can easily return to and understand later when it's time for maintenance or upgrades. And yes, there were two examples in his code that were broken, but they were minor mistakes and he teaches so well that I was able to fix it myself and make the examples work. The first - is actually a great VB/MS HTML helpreference. The second - is by Dan Appleman. Dan's books are a MUST HAVE for serious VB developers. I strongly recommend purchasing a copy of Beginning VB6 Database. Top quality code that works! Gets you into the "preverbal" guts of VB Database programming. Want to learn how ADO works? You will find in Johns book. First rate screen shots of the applications development and the real world examples he presents as you move along from one chapter to the next. And yes all with excellent easy to follow explanations and code. Useful API code and more importantly it works! And guess what John explains why!!! I purchased this book with the intention of getting a better idea of what I need to do to get a grasp on writing database driven applications. This book is wonderful for those who have some VB experience and want to continue learning the more in-depth portions of Visual Basic. I have also used this book in conjunction with my school as a reference guide for my database programming class. Did not like the part that the book covers for the most part DATA controls for MS-Access programming. Not benefecial if your are gonna be using referencial code based coding reference source. Hurray for John Connell he speaks to us beginners on our level. It was also very encouraging when he mentioned that he did not get it the first time, he had a light bulb moment. I have never heard a guru admit that before they usually give the impression that it came very easy for them. The exercises seemed to encompass a lot of VB functions, uses, and neat tricks. The explanations are complete, well thought out, and unambiguous. With little or no exposure to VB any programmer should be able to follow along.